Definition: tide - from the sailor's perspective - is the vertical rise and fall of the sea level surface caused primarily by the change in gravitational attraction of the moon, and to a lesser extent the sun. Note, that in the rotating systems we are about to discuss, it is more appropriate to use the term centrifugal force (“fugare” is latin for “to flee”) than centripetal force (“petere” is latin for “to seek”, “to pursue”): see centrifugal versus centripetal. The earth is also in orbit around the sun (one revolution in one year) creating not only another centrifugal force but also a gravitational interaction. These two yield a bulge on the night site (centrifugal) and a bulge on the day site (gravitational) both of them moving as the world turns. Therefore, a certain place on this world will experience two high and two low tides each day. spring tides — word origin: Old English Springere, meaning to rise or spring up. neap tides — word origin uncertain: possibly Old English, as in nēpflōd neap tide. Or an acronym of: near even as possible), or even a Greek word for “scanty”. At the new and full moon, the sun and moon are in syzygy (three celestial bodies in a straight line). Their tidal forces act to reinforce each other, and the ocean both rises higher and falls lower than the average. Conversely, at the first and third quarter, the Sun and Moon are at right angles, their tidal forces counteract each other, and the tidal range is smaller than average. Spring tides have higher high tides and lower low tides whereas neap tides have lower high tides and higher low tides. Hence, the range (difference in water level between high and low tide) is much larger in a spring tide than in a low tide. 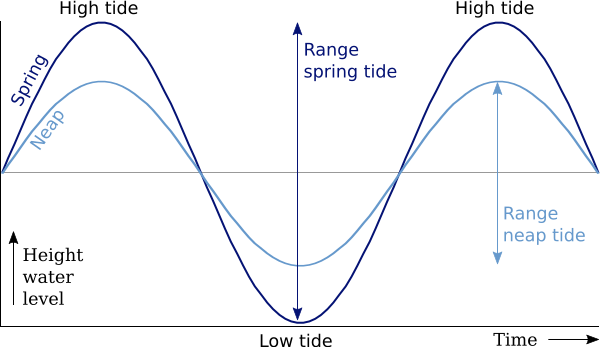 The diagram shows the ideal sinusoids of both spring and neap tides. Vertically the water height is shown versus horizontally the time. Spring tide and neap tide levels are about 20% higher or lower than average. These differences in range can be explained if we include the moon into our earth-sun system. The moon and the earth orbit each other around a center of mass - the barycenter (Ancient Greek: βαρύς heavy + κέντρον centre) roughly 2000 kilometres inside the earth, creating a centrifugal (since the earth goes in circles as well) and a gravitational bulge. Moreover, despite the sun's immensely larger mass, the moon exerts a 2.25 times larger gravi­tatio­nal attraction, since the moon is much closer to our earth. It is the combined effect of the sun and moon that creates spring and neap tides. When aligned with the earth they combine their attraction and otherwise they counteract their attraction. Water has mass and therefore momentum. Moreover, it is a viscous fluid that generates friction if moved. Therefore, the actual spring tide lags a day or so behind a full moon or new moon occurrence. 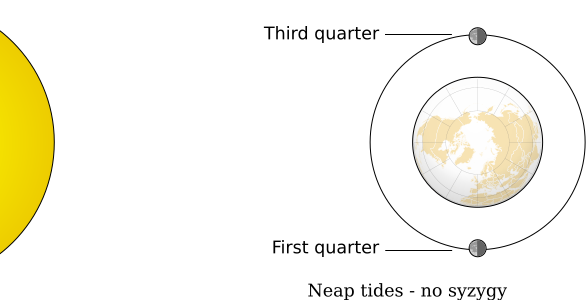 Explore the Beltoforion interactive animation of the sun-earth-moon system to see the neap tides, spring tides and the various forces involved. The time difference between spring tide and neap tide is normally 7 days and is in accordance with the phases of the moon, roughly 28 days divided by 4. 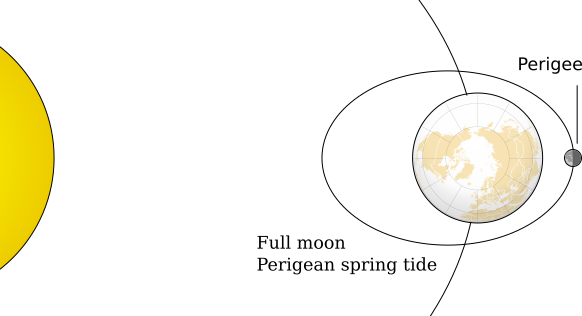 Watch NASA videos: Moon phases - northern hemisphere and southern hemisphere; click the gear icon and set Speed to 2 and Quality as high as possible. The lunar day or tidal cycle or tidal day is 24 hours and 50 minutes. An earth day is a 24-hour period: the time it takes for the earth to rotate 360° on its axis. Meanwhile, the moon is revolving around the earth with a sidereal period of 27 days 7 hours 43 minutes - and in the same direction (prograde direction). Therefore, during the 24 hours that the earth rotates from X at t=0 back to X at t=24 h, the moon will have travelled around the earth as well. The tide will be 50 minutes later tomorrow. Three different tidal patterns - unlike the idealized sinusoid curve pictured above, with two equally proportioned high and low tides every lunar day - can be found on Earth since our planet isn't a perfect sphere without vast continents. These large continents block the westward passage of the tidal bulges as the earth rotates. Unable to move freely around the globe, these tides establish complex patterns within each ocean basin that often differ greatly from tidal patterns of adjacent ocean basins or other regions of the same ocean basin. Furthermore, ocean currents, constrained waterways, friction, archipelagos, the Coriolis effect, and coastal topography (headlands, shoals, reefs) influence the rise and fall of the sea level. As a result different tidal cycles can be experienced in different regions of the world. A semidiurnal tidal cycle consists of two nearly equal high tides and two nearly equal low tides within the lunar day. The tidal period is 12 hours and 25 minutes: from high tide to the next high tide. If the planet was covered entirely with water and without any continents obstructing the free motion of water, semidiurnal cycles would be default. Most of the world's coastlines have semidiurnal tides. The term diurnal can mean “during the day” (antonym of nocturnal), but with respect to tides it means “Having a daily cycle that is completed every 24 hours”. The prefix “semi” means “half”. A diurnal tidal cycle is a cycle with only one high and low tide each lunar day. The tidal period is 24 hours and 50 minutes and indeed twice as long a the semidiurnal cycle. Diurnal tides can be found in the Gulf of Mexico and on the East coast of the Kamchatka Peninsula. A mixed semidiurnal tidal cycle is a cycle with two high and low tides with different sizes each lunar day. The difference in height between successive high (or low) tides is called the diurnal inequality. Areas with a mixed semidiurnal tidal cycle can be found alongside the West coast of the USA, the Caribbean in parts of Australia and in South East asia. An apsis (Greek: ἁψίς; plural apsides: ἁψῖδες) is an extreme point in an object's orbit, which is nearly always an ellipse. There are two apsides in one elliptic orbit, named with the Greek prefixes peri- (περί meaning “near”) and ap(o)- (ἀπ(ό) meaning “away from”) added to a reference to the celestial body being orbited. Tides are affected by the orbit of the moon around the earth and, less so, by the earth around the sun. -gee refers to earth (Gaia) -helion refers to the sun (Helios). Top view of the solar system, not to scale and ellipses exaggerated. View the apparant size differences of apogee-perigee moon and aphelion-perihelion sun. Note, that the distance variance to the moon plays a minor role in tidal heights and that the distance variance to the sun plays a minute role. About three or four times a year (in the spring and the fall), the new or full moon coincides closely in time with the perigee of the moon, resulting in a king tide or perigean spring tide. The difference between perigean spring tide and normal tidal ranges is small: 15 centimeters or 2% maximum. 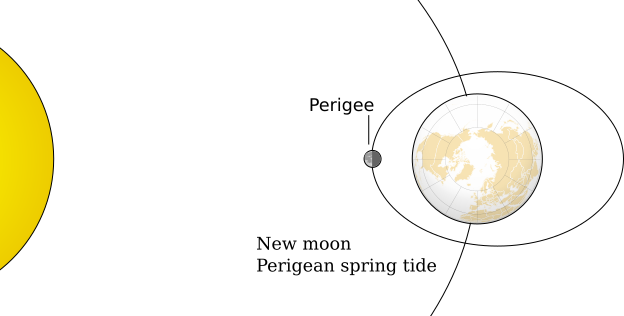 The perigee of the moon can occur at any point in the orbit around the earth due to apsidal precession (play around with an interactive animation); for mariners the full moon perigee (diagram above, top view) and the new moon perigee (diagram below, top view) are of significance. The axial tilt of the earth and the orbital tilt of the moon will be taken into account next. Note that the “moon's orbit” is not to be confused with “a lunar orbit”, the former is the orbit of the moon, the latter an orbit around the moon. Also, generally the adjective “elliptic” is used when describing these orbits, since “elliptical” can also mean: a shape reminding of an ellipse; oval. The Earth axis is tilted 23.44° against the ecliptic: the plane of the earth's orbit around the sun. Besides giving rise to the seasons, this tilt influences local tides as can be seen by the tidal bulges (exaggerated) in the diagram below. Note, that these two successive high tides are unequal. A person anywhere on a given latitude would experience two different tidal heights in a row. 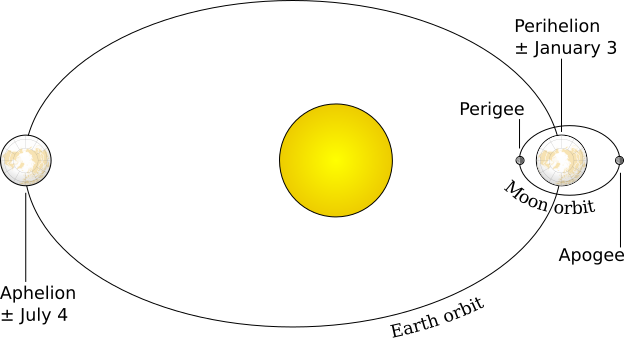 Side view of the earth's axial tilt resulting in different successive tidal heights. The Moon's orbit is tilted 5.14° against the ecliptic. In other words: the inclination of the moon's orbit to the ecliptic is 5.14°. The diagram below shows a side view (tidal bulges left out). 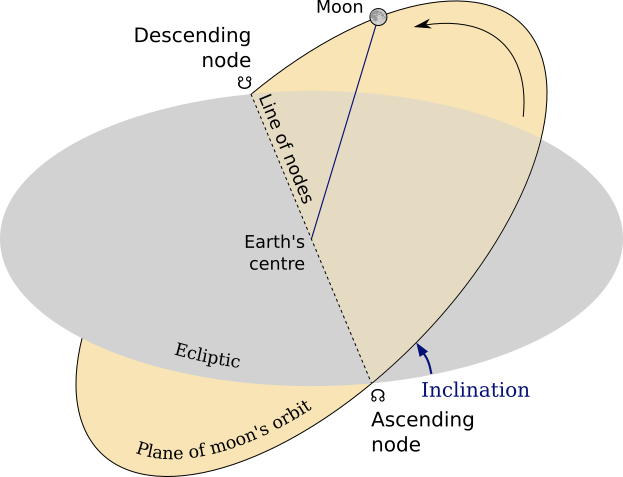 The diagram below shows the lunar nodes, which are the points where the orbit of the moon crosses the ecliptic, as well as the line of nodes where both planes intersect. The tilt or inclination is exaggerated. The ascending node, where the moon sets below the ecliptic, is historically referred to as the dragon's head ☊ (Caput Draconis) and the descending node, where the moon rises above the ecliptic, as the dragon's tail ☋ (Cauda Draconis). The plane of the moon's orbit precesses in space and hence the lunar nodes precess around the ecliptic, completing a revolution of 18.61 years, a draconic period. Again, referring to dragons, like hic sunt draconis and not “draconian” (after Draco, first legislator of Athens). Some places on Earth experience only one high tide (and one low tide) in a 24-hour period instead of two. The moon doesn't orbit the Earth directly over the equator. Instead, its orbit is inclined by about five degrees from a line extending between our planet and the sun. Also, depending on our position in our orbit around the sun, the moon's orbit can be inclined by as much 23.5 degrees. This inclination causes the tidal bulges to often form above and below the equator. When this happens, it's possible for locations on the rotating Earth to pass through only one of the two bulges, thus producing only one high tide. Tide: The rise and fall of the surface of a body of water caused primarily by the differences in gravitational attraction of the moon, and to a lesser extent the sun, upon different parts of the earth when the positions of the moon and sun change with respect to the earth. Spring tide: The tidal effect of the sun and the moon acting in concert twice a month, when the sun, earth and moon are all in a straight line (full moon or new moon). The range of tide is larger than average. Neap tide: This opposite effect occurs when the moon is at right angles to the earth-sun line (first or last quarter). The range of tide is smaller than average. Range: The vertical difference between the high and low tide water levels during one tidal cycle. Tidal day or Lunar day: 24 hours and 50 minutes. The moon orbits the earth every month, and the earth rotates (in the same direction as the moon's orbit) on its axis once every 24 hours. 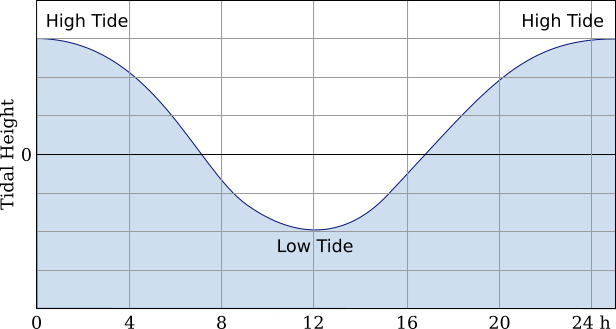 Tidal cycle: One high tide plus a successive low tide. 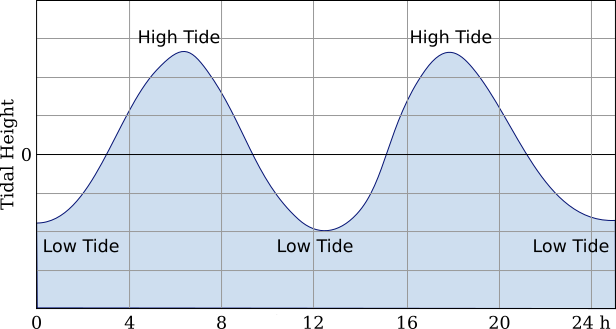 Semidiurnal tide: The most common tidal pattern, featuring two highs and two lows each day, with minimal variation in the height of successive high or low waters. Diurnal tide: Only a single high and a single low during each tidal day; successive high and low waters do not vary by a great deal. Such tides occur, for example, in the Gulf of Mexico, Java Sea and in the Tonkin Gulf. 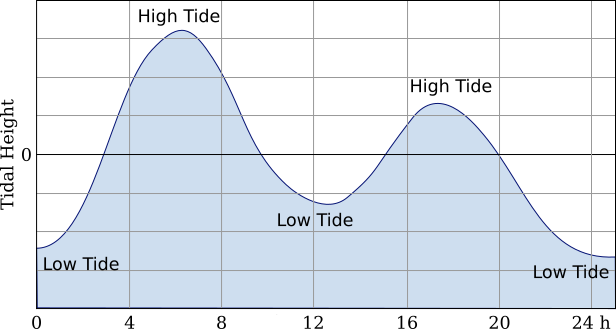 Mixed Tide or Mixed semidiurnal tide: Characterized by wide variation in heights of successive high and low waters, and by longer tide cycles than those of the semidiurnal cycle. Such tides occur, for example, in the U.S. Pacific coast and many Pacific islands.